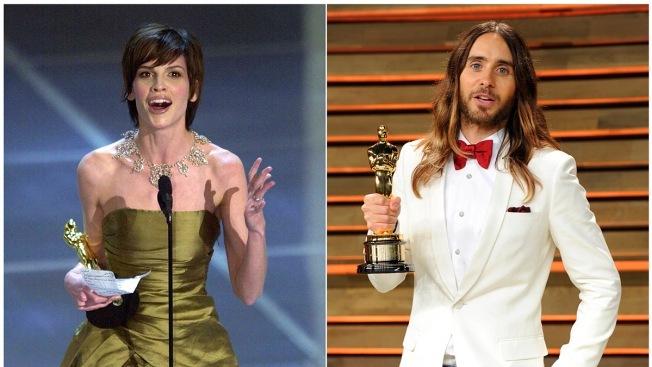 In this combination file photo, Hilary Swank accepts the Oscar for best actress for her role in "Boys Don't Cry" during the 72nd Academy Awards in Los Angeles on March 26, 2000, left, and Jared Leto poses with his Oscar for best supporting actor for "Dallas Buyer Club" at the 2014 Vanity Fair Oscar Party in West Hollywood, Calif., on March 2, 2014. Swank and Leto portrayed transgender characters. When actress Scarlett Johansson reversed course recently and canceled plans to play a transgender man in the film "Rub & Tug," transgender actors like Scott Turner Schofield were gratified — and pleasantly surprised. After years of watching non-trans stars win accolades — including Oscars — for what was seen as bravery in playing transgender characters, finally it seemed that somebody got it.